Shipping for Pallets is precalculated in the Shopping Cart. 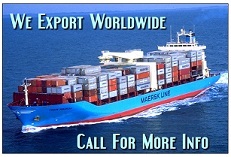 For Truckloads, a rep will contact you regarding the shipping charges. All Sales are Final. Any Deposits made to reserve a truckload are final and non refundable if the customer does not complete the order or pay the balance within 30 days, as the deposit is used to secure and reserve the merchandise.